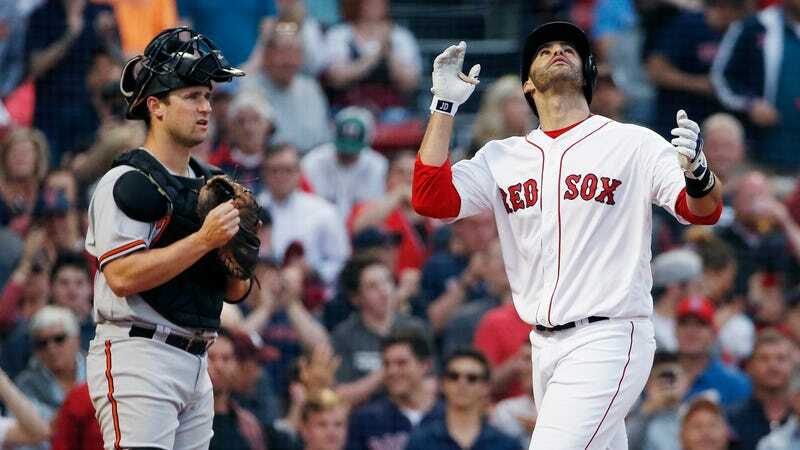 New Red Sox signing J.D. Martinez had a very, very good first month in a Boston uniform—an April OPS of .994 is nothing to sneeze at—but Just Dingers has truly been living up to his nickname since May began. And in his first at-bat tonight against the Orioles, J.D.’s fifth-gear hot streak got even more impressive. That’s Martinez’s eighth dinger already in May, after a relatively paltry five before this month. And while it puts him in a very crowded tie on the MLB home run leaderboard, Martinez’s .348 average is only surpassed in the AL by Mookie Betts—and Mookie’s his teammate, so that’s really just another scary thing to brag about. Over the past couple weeks, Martinez is going yard at a rate better than every other game. Just last night, he smacked a big fly against the A’s that hit almost the same location as today’s in deep center field. There are more in his recent history, including the tiebreaking dong at Yankee Stadium that barely avoided Aaron Judge’s glove and kept the Sox from getting swept in an important early-season series. The long-ball heroics are nothing entirely new—Martinez’s 16-tater September last year with the Diamondbacks set a pretty high bar—but it’s nice to know that the big-money contract doesn’t seem to be changing him.